The "dark" side of the moon isn't really darker than the "light" side of the moon. But that far side does appear to get colder at night. Earth's moon is tidally locked to the planet, meaning that the same side of the moon faces us at all times. But the moon is still spinning in order to constantly point one face at us, so it experiences days and nights from the varying sunlight. These periods are about two Earth-weeks long. Data from the Apollo missions had already revealed that the moon's sunlit surface can climb to 260 degrees Fahrenheit (127 degrees Celsius) during the day, and drop to minus 280 F (minus 173 C) at night. But all of that data comes from the side of the moon that faces Earth. 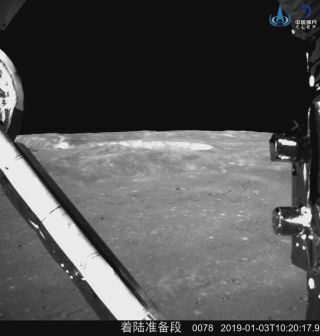 The new Chinese mission that landed on the "dark" (read: far) side of the moon on Jan. 3 has recorded even colder temperatures during the long lunar night. The difference between Chang'e 4's reading and the Apollo missions' is "probably due to the difference in lunar soil composition between the two sides of the moon. We still need more careful analysis," Zhang He, executive director of the Chang'e 4 probe project, told Xinhua. In other words, something about the lunar dirt where Chang'e 4 sits is probably causing the soil to retain less heat overnight than the Apollo landing sites did. But researchers still aren't sure what that something is. Chang'e 4 and Yutu 2 are the first probes to explore the far side of our nearest neighbor, so the data they return will be one of a kind. It may be a long time before researchers have a firm answer to the temperature-difference question.